May Camp is a retreat weekend for youth that includes chapel sessions, meals together, free time and activities, field games, a talent show, and lots of other fun stuff—all at beautiful Green Bay Bible Camp on Lake Okanagan! We partner with our sister Baptist churches: Sunshine Ridge (Surrey), Ebenezer (Vancouver), Chilliwack, Lakeview Heights (West Kelowna), and Faith (Vernon). May Camp is a great way to build friendships and meet youth from other churches. Our Chapel sessions feature upbeat worship, games, and a speaker. Spend your afternoons swimming, kayaking, on the field, playing games, offsite at one of our activity options, making a Starbucks run with a youth leader, or just relaxing on the beach! This year we have rented a coach bus to transport us there and back - we are leaving earlier than previous years to beat the Hwy 1 traffic jams that always seem to delay us. The bus features comfortable seating, a small bathroom, and luggage storage. Accommodations: Green Bay is designed as a family camp with several facilities and features - the girls stay in the Lodge building with bathrooms in their rooms; guys stay in the Cabins with a common bathroom; camp also has a dining hall, Chapel, enclosed waterfront area for swimming, kayaking, etc., grassy areas, beach, RC car pit, and large field. The Lodge also has a common space for teens to hang out with couches, foosball, etc. We are a 5 minute drive from West Kelowna centre (groceries, fast food, clinic, etc.) and a 15 minute drive from Kelowna. - Clothes for the weekend - be sure to check the weather! Please avoid large bulky items (e.g. your guitar) but please feel free to bring activities such as board games, girls' night supplies, snacks, etc. - Phones/tablets - we will be collecting these items when you get off the bus on Friday night (if you choose to bring it on the drive). Our no tech rule is camp wide - we encourage teens to spend time enjoying face-to-face friendships, and this rule prevents lost or damaged equipment - something that seemed to happen every year. Enjoy your phone on the bus rides, and know that when we collect them they will be locked in a safe in a secure location for the weekend. Amanda will post on this blog and in our Facebook group to let parents know that we have arrived safely. In case of emergency, call Green Bay to get a hold of Amanda or your child. If teens need to get in touch with parents, we will unlock the safe to let them use their phone to contact parents before it is locked up again. - Head to camp approx 7pm. - free time - unpack, etc. - Arrive at Bethany approx 6pm. Welcome to the blog for BBC Student Ministries! 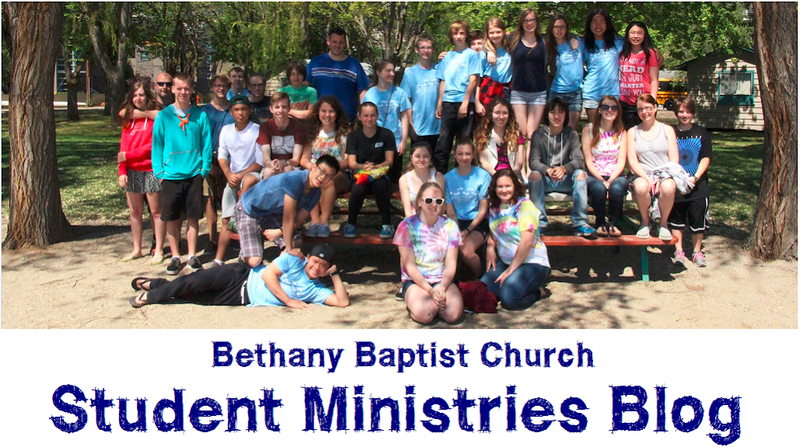 I'm Amanda, the Student Ministries Director, blogging about what we do here at Bethany. This blog focuses on grades 6-12 and is a resource for parents and students (event info, recaps, parental help, and useful websites are posted here). College students can check our Facebook group for weekly Bible study info (link below). For more information, look below for online links, or call the church office at 604-519-0123.